73Hp 3-Cylinder 2.6L Simpsons Diesel engine, 4X4, 2 Hydraulic remotes, 8Fx8R Synchro Shuttle transmission. 911X loader with Skid steer quick attach and block heater. This unit will make Old man winter want to run into Spring time arms! GC1715L complete Tektite Cab (heat,Radio,wipers), loader with 48" bucket and 54" Rear mounted snow blower. 26Hp, 3 Range hydrostatic, 4X4, L105E loader with 60" bucket and skid steer quick attach. NO Emissions!! 34Hp, 3 Range hydrostatic, 4X4, L100 loader with 60" bucket and skid steer quick attach. 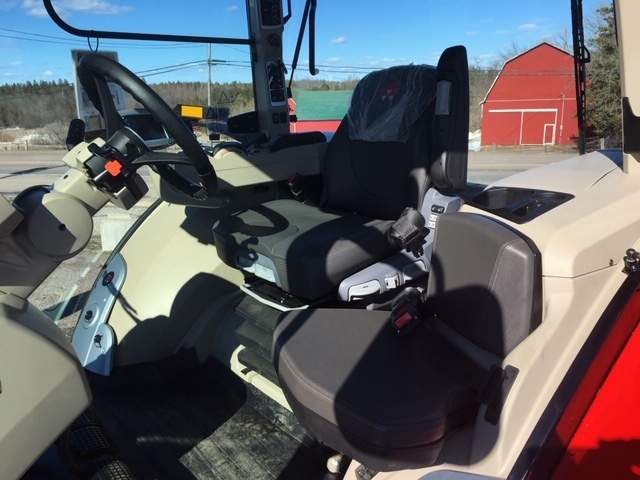 36.2Hp, 3 cylinder liquid cooled diesel engine, 3 Range hydrostatic,Cab, heat, A/C, radio, block heater, DL120 loader with 72" HD bucket with skid steer quick attach. 39Hp, 3 Range hydrostatic, 4X4, L105E loader with 60" bucket and skid steer quick attach. CB75 backhoe with 7. 5Ft digging depth, 16" bucket and mechanical thumb. Price: Sold!!! Another unit Coming in!! 57Hp 2.2L 4-Cylinder diesel, 3 Range Hydrostatic,4X4, Loader with 72" Skid steer quick attach bucket and 2 hydraulic remote outlets. Massey’s New 4700 series just arrived and its the “Deluxe” Version. 90Hp 3-Cylinder 3.3L, 12X12 Power Shuttle, Swivel Air Ride seat, Programmable Preset engine RPM’s, 540/1000 PTO, 4 Hydraulic outlets, Work light package, 936X Self-levelling loader with 84" bucket, 13.6R24 and 18.4R 30 Tires. Come have a test drive! 100Hp 3-Cylinder 3.3L, Deluxe Version, 12X12 Power Shuttle, Swivel Air Ride seat, Programmable Preset engine RPM’s, 540/1000 PTO, 4 Hydraulic outlets, Work light package, 931X loader with 84" bucket, 13.6R24 and 18.4R30 Tires. Come have a test drive! 100Hp 3-Cylinder 3.3L, 12X12 Power Shuttle, Swivel Air Ride seat, Programmable Preset engine RPM’s, 540/1000 PTO, 4 Hydraulic outlets, Work light package, 936X Self-levelling loader with 84" bucket, 13.6R24 and 18.4R30 Tires. Come have a test drive! Massey’s New 5700 series just arrived and its the “Deluxe” Version. 110Hp 4-Cylinder 4.4L Diesel Engine, 12X12 Electro Hydraulic Power Shuttle, Swivel Air Ride seat, buddy seat, Programmable Preset engine RPM’s, 540/540E/1000 PTO, 4 Hydraulic outlets, Work light package, 946 Self-levelling loader with 84" bucket, 14.9R24 and 18.4R34 Tires. Come have a test drive! 110Hp 4-Cylinder 4.4L Diesel Engine,Deluxe Version 12X12 Electro Hydraulic Power Shuttle, Swivel Air Ride seat, buddy seat, Programmable Preset engine RPM’s, 540/540E/1000 PTO, 4 Hydraulic outlets, Work light package, 941 Loader with 84" bucket, 14.9R24 and 18.4R34 Tires, Front pivoting fenders. 130Hp 4-Cylinder 4.4L Diesel Engine,Deluxe Version 12X12 Electro Hydraulic Power Shuttle, Swivel Air Ride seat, buddy seat, Programmable Preset engine RPM’s, 540/540E/1000 PTO, 4 Hydraulic outlets, Work light package, 946X Loader with 84" bucket, 380/85R28and 460/85R38 Tires, Front pivoting fenders and Rear Weights. 7.4L 6 Cylinder AGCO Engine,260 Max Engine Hp, 180 Pto Hp, Deluxe, Dyna-VT “CVT” 50Kph Transmission, Duals, Cab Suspension, Guidance equipped, Pivoting Fenders,Fully Loaded! 350Hp 8.4L AGCO Power Diesel engine, Dyna-VT 50Kph Transmission, Performance package, Suspended front axle, deluxe leather package, Xenon lights, 6 Electric finger tip hydraulics, 480/70R34, 480/80R50 Tires. Fully Loaded!! 22.5Hp, 3 Cylinder diesel engine, 2 range hydrostatic with cruise, DL100 loader with 48" bucket. 25Hp, 3 Cylinder diesel engine, 2 range hydrostatic with cruise, DL95 loader, CB65 curved boom backhoe with 78" digging depth and 1 cubic foot bucket, arm rests and rear work light! 25Hp, 3 Cylinder diesel engine, 2 range hydrostatic with cruise, DL95 loader, CB65 curved boom backhoe with 78" digging depth and 1 cubic foot bucket and rear work light!